The original formula, a 20-19-20 NPK watersoluble fertilizer base (nitrogen, phosphoric anhydride and potassium oxide) and minor chelated elements with great assimilation by the plants, such as Boron, copper, Iron, Manganese, Molybdenum, Zinc. Naphthylacetic Acid (NAA), a growth hormone easily assimilated, with no stop effect, once we stop the orchid simply return to its normal growth rhythm. Thiamine, or Vitamin B1, which promotes the development of new roots and ensures a healthy and strong root system. Tahtso is made with products that eliminate the problem of soluble salts excess and their security is very high to avoid stains or burns on leaves and roots. All the effectiveness of the original formula with the exception of the aid to growth, Basic tahtso contains the same elements as tahtso without Naphthylacetic Acid, growth hormone. Specially formulated for professionals or amateurs who are not comfortable using hormones in plants. A base 20-19-20 NPK fertilizer (nitrogen, phosphoric anhydride and potassium oxide) completely soluble in water and minor elements in chelated form, providing easy assimilation, such as boron, copper, iron, manganese Molybdenum, Zinc. Thiamine, or vitamin B1, which promotes the development of new roots and ensures a healthy and strong root system. Basic tahtso is made with products that eliminate the problem of soluble salts excess and their security is very high to avoid stains or burns leaves and roots. 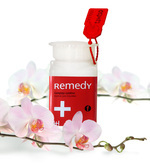 Remedy kills the most common strains of bacteria and fungi that can attack our orchids. Remedy F , systemic fungicide speciallized for treatment against endo and ectoparasites Fungi like: Anthracnose, Oidium, Monilia, Spotted, Screening, Botrytis, Roya, Cladosporosis, Fusarium, Septoria. Some symptoms of fungal diseases are: dry-type injuries, damaged and brittle areas, dry ends and flowers with dark tone circular points. Remedy B , systemic bactericidal for curative and preventive treatment against bacteria like: Xanthomonas, Erwinia, Pseudomonas. The symptoms of a bacterial infection are soft lesions with irregular edges chlorotic, water soaked areas with bad smell, yellow spots, scabs.